Have you ever felt like the only person in the room who didn’t get something? And you felt too embarrassed to ask for an explanation? Maybe it was in a classroom or business meeting or a social gathering where everyone was vigorously nodding in agreement, chuckling at an inside joke, or jumping to the next topic of discussion before you could make heads or tails of what just happened? We’ve all been there — not understanding something as quickly as others (or so it seems) and experiencing a wave of negative feelings because of it. It starts in school: there are “bright” students who are praised for learning quickly and performing well and “dull” students who are frowned upon for being “slow,” not “applying” themselves, and getting poor grades. Rather than question the education system and the one-size-fits-most approach imposed upon us, many of us readily blame ourselves for our own perceived shortcomings: If I don’t get something, there must be something wrong with me. The problem continues well into adulthood. Often, when we explain something to co-workers or others, we expect them to follow along at our pace: If I get it, why shouldn’t they? Worse yet, we may rid ourselves of any responsibility: If they don’t get it, too bad — that’s not my problem. We even label those who don’t match our accepted speed of comprehension — slow on the uptake, not on the ball, dim, not the sharpest knife in the drawer, etc. 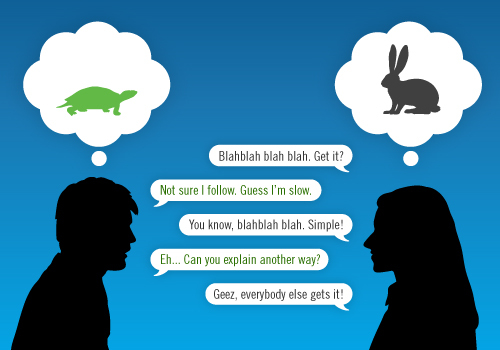 Sadly, the notion of explaining concepts to presumed “slow” people has spawned its own industry. Idiot’s Guides and (Fill-in-the-blank) for Dummies books provide generally useful instruction on a variety of topics, but the marketing wrapper for that content reinforces the stigma of presumed stupidity. Despite the light-hearted tone and humorous illustrations, the message behind such books is that anyone who needs a little extra help to get by in life is somehow inferior. Why does the thoughtful, clear explanation of anything have to be targeted to “idiots” and “dummies”? And when did intelligence become associated with how fast someone learns something? Show the whole picture, then focus on the parts. Just starting with detail or component pieces makes it hard to see how everything fits together and may alienate those who are unfamiliar with the larger system. A bird’s-eye view of content helps establish boundaries and relationships, so that learning is cumulative and associative from one part to the next. Provide persistent navigation and orientation. The longer the presentation or amount of content, the easier it is for someone to lose track of where they are and get confused. Much like a physical space, guiding someone through new or difficult content requires markers and signposts to let them know how far they’ve gone, how much is left, and of course, where the end is. A mini table of contents on every page of a presentation can help mark the journey: each section can be “lit up” when it’s active and greyed out when it’s not. Even a simple “three things” or “five things” construct can help make information memorable. Set checkpoints to confirm understanding. It’s easy to march right through an explanation or presentation of something we’re familiar with. It’s also easy to forget what it’s like not to be familiar with that same material, which is why it’s essential to regularly confirm understanding — genuine understanding — with an audience in-person. Slow down, scan people’s body language, look for frowns or squints, and even if the telltale signs aren’t visible, proactively ask “did that make sense?” or “should I repeat that?” to see where further explanation is needed. Often, requests for clarification don’t come on their own, so encourage questions — just don’t call them “stupid” questions. Prepare multiple explanations. A single, literal explanation of a technical subject may work perfectly well… for a technical audience. Multiple metaphorical explanations, in which concrete, tangible examples represent abstract or complex concepts, can be devised for almost anything and for almost every audience. You can usually tell when someone knows their stuff when they can easily generate compelling illustrations of the same thing using rich, memorable metaphors in order to bridge an understanding gap. Promote patience. This is probably the toughest of all. Not only is it important for the explainer/presenter to be patient with an audience and do whatever it takes to help them get something, but it is vital that group members (when dealing with a team setting) manage their behaviors and not intimidate those who need more time or effort to process. Collaborative work suffers when team members possess different levels of understanding about their project, so it benefits the entire team to bring everyone up to speed and leave no one behind. For some, making sense of the world is a race down a highway. For others, it’s a winding, rambling road. Regardless what pace suits our audience, we still need to ensure they move toward understanding at a speed that suits them best — whether we’re information designers or not.